Sometimes, a low price for a stock is a sign of value. The company might be trading at a low price, for example, because it is in the midst of a turnaround. This is, in fact, the underlying reason value investing strategies work. This has even been documented in the academic literature. Nobel Prize winning economist Richard Thaler published a Journal of Finance article with Werner De Bondt in 1985 called “Does the Market Overreact?” It was the first study to demonstrate that value investing beat the market. In this study, Thaler and De Bondt created portfolios of the best and worst performing stocks. The 35 best performing stocks over the past three years were placed in a “winners portfolio” while the worst 35 performers created the “losers portfolio”. Over the subsequent three years, the losers portfolio consistently beat the market and the winners portfolio consistently lagged the market. In other words, losers became winners and winners became losers in the long run. It’s important to remember that this is a long term test. In the short run, stocks tend to trend and winners continue to win while losers continue to lose. According to many papers the short run for these strategies consists of time periods between 3 months and 1 year. In the paper, the authors theorized that in both cases, investors overreacted. For the losers, investors overreacted to bad news. This pushed the stock’s price below its fair value. For the winners, investors overreacted to good news and pushed the price of the stock up by too much. Over time, in both winners and losers, the overreaction was reversed, and the stock price eventually moved towards its fair value. Other researchers have found that the winners tend to have valuation metrics while the losers tend to have low metrics like price to earnings (P/E) ratios, price to sales (P/S) ratios or price to book (P/B) ratios. Using any of these metrics has been shown to deliver market beating results in the long run. Options are a versatile trading tool and it is possible to use options to take a long term position in a stock. 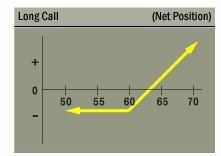 In this case, when the stock is expected to rise, the trader can simply buy a call option. Long term call options expiring more than a year from now are available for Rite Aid and that matches the time frame of the analysis of the stock presented above. Buying a call has many of the same benefits of owning the stock. The upside of the position is potentially unlimited. However, unlike when owning a stock, the downside risks are strictly limited and can never exceed the amount paid to buy the call. The potential rewards and risks of owning a call option are summarized in the chart below. One disadvantage of options relative to stock ownership is that option holders do not receive dividends which can be substantial. This problem, of course, is not a concern when the stock does not pay a dividend. Rite Aid Corporation (NYSE: RAD) has been moving higher since reaching an agreement to sell 1,932 stores, three distribution centers and related inventory to Walgreens Boots Alliance Inc. (NYSE: WBA) for $4.375 billion in cash. The company has already completed the transfer of 357 stores and related assets for net proceeds of about $715 million so far. And, the stock price seems to have finally found a bottom. The long decline and low valuation sets this stock up as potential loser under the overreaction hypothesis. Valuations are also low. The P/E ratio is not meaningful since the company is expected to report a loss this year. The P/B ratio of 2.9 is in line with the long term average for the company. The P/S ratio of 0.09 is less than half the company’s long term average of 0.21. It is just one fifth of the current industry average. In essence, it appears that there has been a great deal of bad news about the company in the past and the stock has sold off and underperformed the market. Now, there is good news developing and we can expect the price to overreact to the up side. Rite Aid is a low priced stock with significant up side potential in the long run. It’s price of about $2.25 puts the shares within reach of small investors. But, the stock doesn’t pay a dividend and long term call options could improve the potential returns. For Rite Aid, the January 2019 $2 call is trading at about $0.70. This call will be worth at least $1 if Rite Aid reaches $3 a share before the option expires on January 18, 2019. Owning 100 shares of stock in Rite Aid would require more than $225 of trading capital. The option requires just $70 to buy. Owning three call options requires almost the same amount of capital as owning 100 shares. But, the calls could deliver a larger gain if RAD reaches $3 per share than 100 shares of the stock. At $3 a share, the three contracts would have a value of at least $300, a gain of more than 40% of the amount invested. Buying 100 shares would deliver a gain of just 33%. The risk is $0.70 per share when buying the calls. Risk is 100% of the amount invested when buying the shares of the company. Overall, there is an extraordinary reward to risk ratio in the long term options making them a better alternative than the shares for many investors willing to buy RAD and accept the risks of the stock. There is a stock trading tips trading service that also seeks to identify this type of gain, Triple-Digit Returns, which uses a very specific system for choosing the right stocks to trade. Triple-Digit Returns looks for companies that are misunderstood and potentially undervalued, lost darlings (companies that are like Rite Aid), mergers or spinoffs that could benefit share holders, or companies that show signs of strong interest by insiders who know the company best and see value. This service provides a recommendation once a week. To learn more, you can click here.